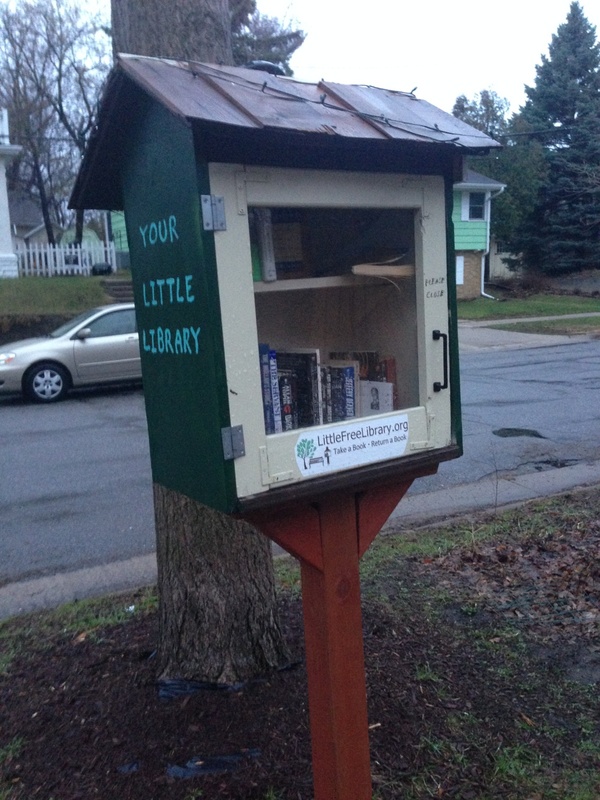 On my walk this morning I discovered that I have not just one, not two, not three, but FOUR Little Libraries my neighborhood! Here they are, each unique, but all variations on such a quaint theme, pictured in order of my discovery of them. 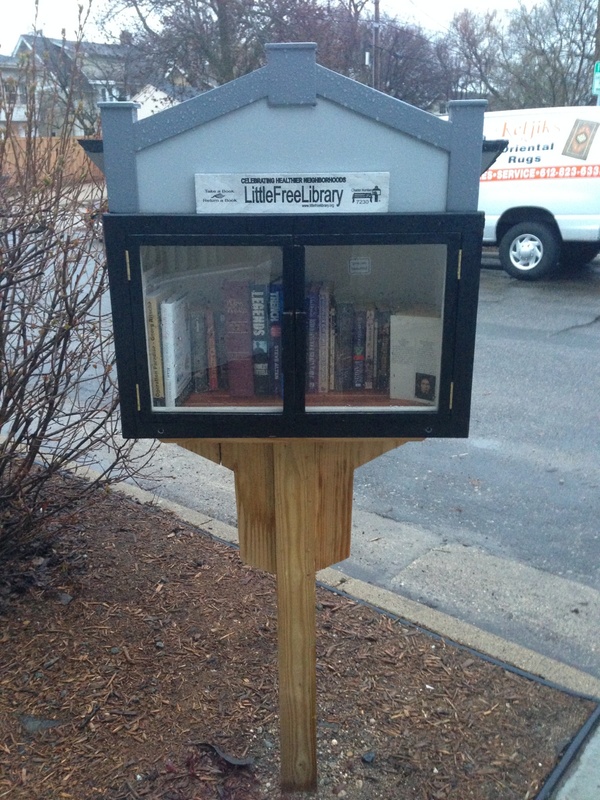 I love the Little Library concept and the fact that there are four so close to me makes a wonderful statement about the quality and literacy of my neighbors. This is so cool! AMENDMENT TO THE BLOG ~ actually there are FIVE! Just added the 5th picture. Had I not decided to wend my walk down different ways, I never would have stumbled upon them. So it seems there is much to be said for varying one’s comings and goings and not getting stuck in a routine. Who knows what one might encounter. I have “checked out” a book from each of them. The first one, which I discovered a couple of weeks ago, at 10 blocks distant is, of the four, the furthest one from my house, which is interesting that I should find this one first. From this one I withdrew the book: The Strengths Finder 2.0, by Tom Rath. The second one, only a half block form my house, I discovered last week and withdrew Taming the Tiger Within, Meditations on Transforming Difficult Emotions. by by Thich Nhat Hanh. Both the third and fourth I discovered this morning. I was pretty astonished. The third is about 5 blocks away. From this I withdrew Oryx and Crake, by Margaret Atwood. It’s a post-apocalyptic novel, so should be interesting reading along side my short story, The Village of the Smokey Hills. The fourth is about 6 blocks away. From this I withdrew The Plains of Passage by Jean Auel, its a novel in the series originating with Clan of the Cave Bear. A nice pairing of imagined pre-history to go with Atwood’s imagined post-history. From the 5th one, about 6 blocks away form my home, I picked up The Girl With the Dragon Tattoo by Stieg Larson. 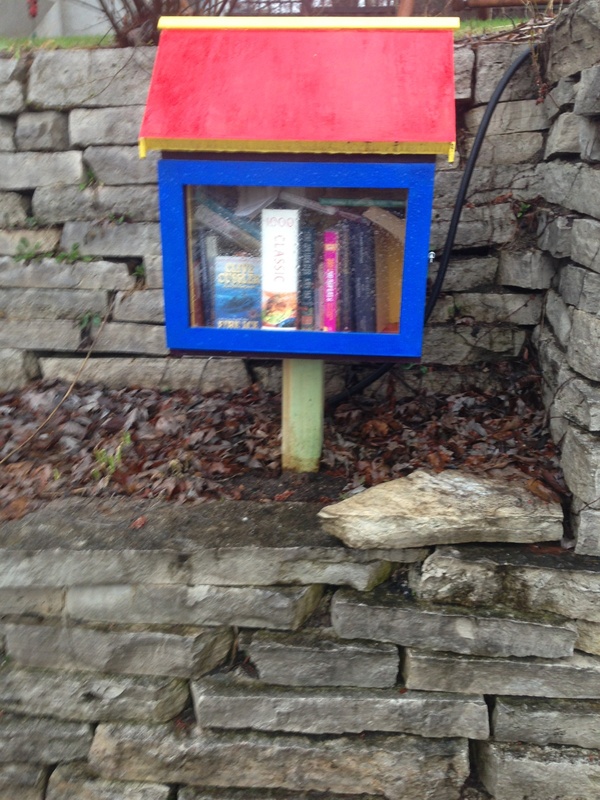 This entry was posted in Little Free Libraries, Zenith Arc and tagged Little Free Libraries, Little Free Library. Bookmark the permalink. What a wonderful concept! That, plus you found excellent books as well! 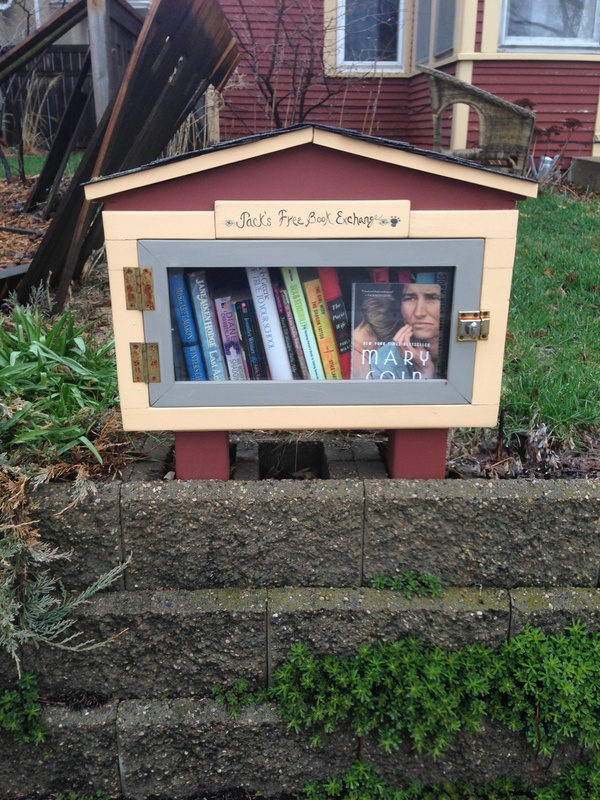 I’ve a friend in Portland, Oregon who has posted images of similar lending libraries and I think it’s a fabulous idea. Lucky you! I’ve read all the Clan of the Cave Bear series but should again since it took her forever to finish the series. Great post! We have two of those in our neighborhood. One is for books but the other is just for sheets of poems that people like. I love stopping at the poem box on my way back from the grocery store. It usually only takes a moment to read a poem and then I just pop it back. It has helped me discover names I would not have likely come in contact with. One poem I really liked was http://judithpordon.tripod.com/poetry/albert_huffstickler_angels_how_they_fly.html by Albert Huffstickler who I didn’t even know was a local poet. That is a lovely poem, thanks for sharing! I really like that idea of the poem box ~ a nice short provocative read along one’s walk. Very nice. He died soon after and was quite ill I believe. I am not a Christian but that idea of forgiving oneself for muddling through life really speaks to me. Oh my gosh. I’ve never seen such a thing. So lovely, so quaint. I wish they were in my neighborhood. You are so lucky to have them!! Yes, I am so charmed by their quaintness. That, coupled with the sentiment and effort people are so freely giving, makes one feel good about our society. They really enhance my life ~ I am very lucky. No, mostly full length books. If I can find time between reading blogs, I’ve got a full reading list in front of me. What wonderful ideas! 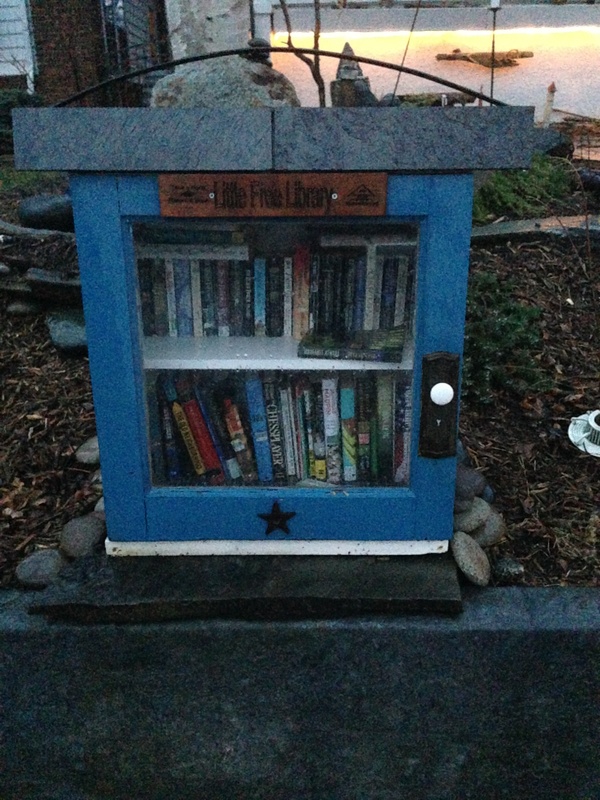 I’ve been looking for a project with spontaneous acts of connection…There is an open alley by my house that people take as a walking shortcut that would be a perfect place for one of these mini libraries… and I’ve been looking for a more creative way to circulate the books I’ve collected lately. Thank you for this inspiration, Cnawan! Thanks for commenting, Jana! I share your enthusiasm of this idea, it truly is wonderful. So good to know that another one will be popping up in the world, thanks to you. I hope you post a picture of it when its completed. Best of luck with your project! I never knew they ever existed……a fabulous idea ! !